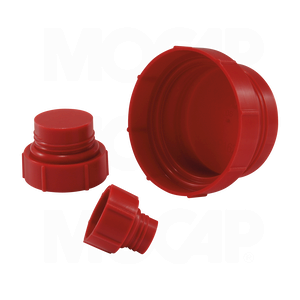 MOCAP Threaded Plastic Plugs are designed for use on Straight Thread O-Ring Ports. These Threaded Plastic Plugs are knurled for easy use in manual assembly and removal. They provide positive seal on SAE Straight Thread O-Ring type ports and MIL-MS-33649 bosses. Integrated O-ring type bead seats in the bevel of the port to prevent entrance of debris or contaminants and oil leakage. Seal at outside of knurl protects port face against paint and dirt. Our OPP Series Threaded Plugs are molded in Red polypropylene plastic and sized to fit Straight Thread O-Ring Ports from 7/16-20 thru 1-5/8-12. MOCAP stocks Threaded Plastic Plugs for Straight Thread O-Ring Ports in many sizes for immediate shipment.